When on a field trip to Dauphin Island Sea Lab with my 5th grade students, I saw an exhibit about NOAA’s drifter program at the Estuarium. It seemed interesting to follow drifters on the ocean’s currents and learn more about our planet in the process. 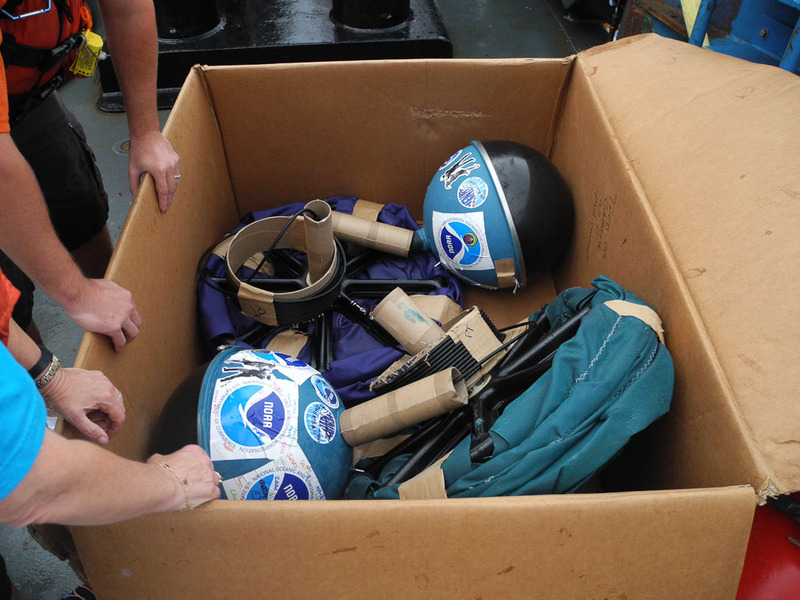 When I returned home from the trip, I visited the NOAA Adopt a Drifter site to see how my classes could get involved. The requirements include having an international partner with whom to share lessons and information. I was fortunate enough to find Sarah Hills of the TED Istanbul College through internet sites for teachers interested in collaborating. Her 6th grade English classes just began the school year and are studying maps. We both applied in late spring to the program as a team, explained our ideas for sharing information, and were accepted. Not only were we assigned one drifter, but two. 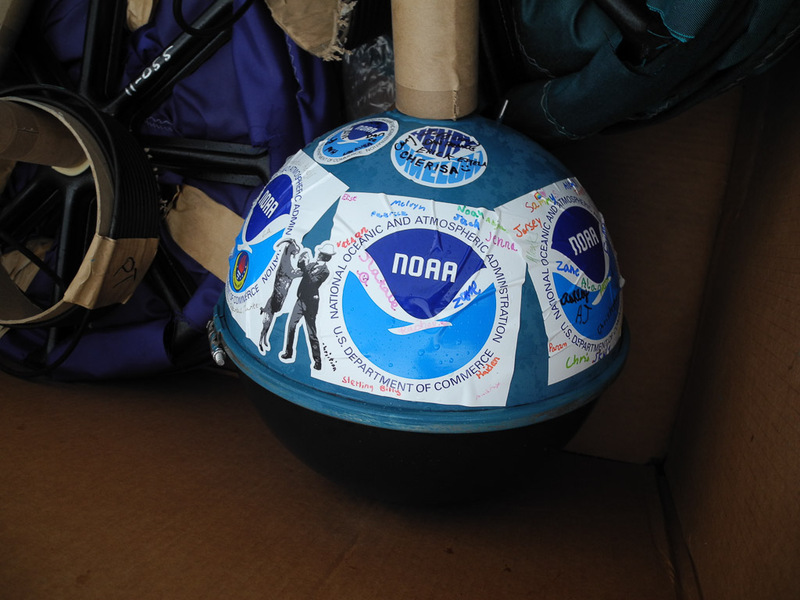 To create ownership for participants, NOAA sent stickers for us to sign and attach to the drifter. I was set to sail at the beginning of September so Mrs. Hills signed for her students. In addition to our friends’ stickers from Turkey, I attached stickers to the drifters signed by crew members, my students, friends, the science crew on board, and the NOAA officers on the Bigelow. Sunday we deployed our drifters. They had come in a large cardboard box which had been sitting on the stern of the ship for almost two weeks. The directions were very simple. I just had to write down the identification number, rip off the magnet to turn it on, toss the drifter overboard, and write down the coordinates and time. Drifters shipped to Bigelow and stowed in shipping box on fantail. We were working close to the Gulf Stream so the captain had us enter the Gulf Stream so the drifters would catch that strong current and move out to sea. The water was pretty rough in the Gulf Stream, but, oh, the color of the water was a beautiful blue. When deploying (tossing it in the water) the drifter, I was not to remove any of the cardboard since the salt water would soften it and allow the drogue down below to drop down underwater (and it wouldn’t expand on the ship causing serious injury to us). The bosun (chief deckhand) suggested we push it off the fish board on the port stern quarter rather than tossing due to a lack of room. 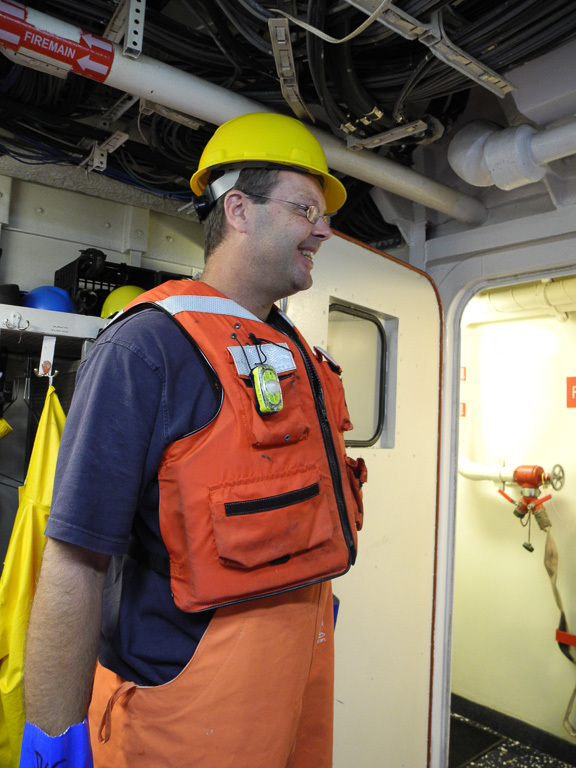 The captain took pictures for me with my camera and the chief scientist ran the GoPro (a video camera). Must be an important operation when my two head bosses on the ship participate. 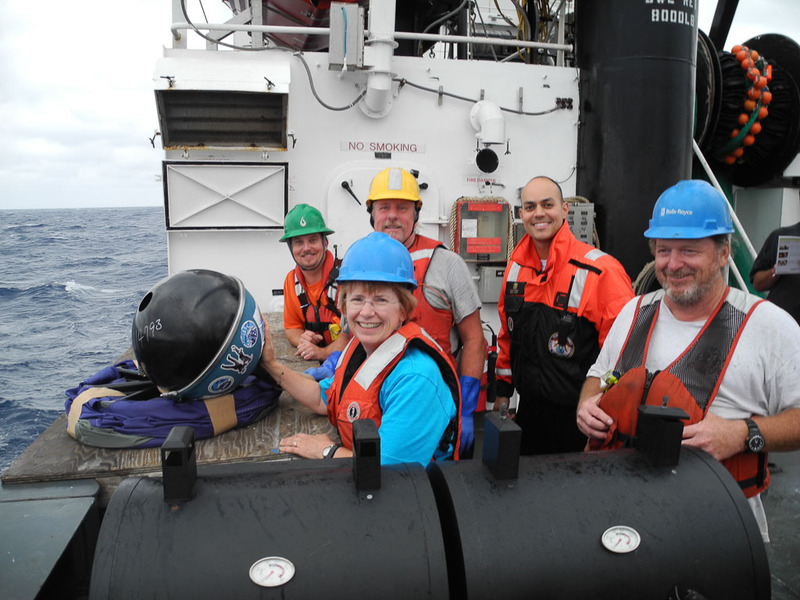 We also had deckhands, Steve and James, our survey technician, Geoff, and Ensign Estela joining in on the fun. After deploying the drifters, we watched them float in the Gulf Stream behind us. Where do you think they will end up? Track them and see where they are. Both drifters came online when tossed in the water. However, one of them turned off shortly after it began its journey. Only time will tell if it turns back on. I wrote down the necessary data on the form NOAA provided, took a picture of it, and sent it to the Drifter Team back at NOAA. They needed to assign them tracking numbers and put the link to the drifters on the web site. The drifters last about 400 days. Click here to learn more. John is a mild-mannered man. He thinks through his answers and is very thorough to make sure his listener understands what he means. John has worked with NOAA for 23 years. I asked what he would be doing if he didn’t work with NOAA and he said, “Something outside with fish.” Can you guess what his hobbies are? There really is just one. Fishing. He loves fly fishing, trawling, casting, deep-sea fishing, you name it. If it involves fish, he loves it. As a matter of fact, he was so passionate about fish growing up that people always told him he would be a marine scientist. He grew up on Cape Cod in Massachusetts and loved to be outside, especially with fish. John is passionate about the state of the environment. When I asked why he believes what we are doing with the Autumn Trawl Survey is important, he stated that it is imperative to monitor the health of our ocean through the survey. Data about fish populations (or most environmental science) must be collected over a long period of time, and using the same method, in order to make comparisons. Is what’s happening today different than what was happening 40 years ago with our fish populations? John said, “If we didn’t know what was there 20 years ago, for example, we wouldn’t know if the population of a fish species is more or less abundant.” This is the information we are gathering for scientists to evaluate. What we are doing directly affects commercial and recreational fishing. He called this “pressure” since fisherman are changing the population of the fish they are catching. So, the surveys are looking to see what impact these pressures have on the fish. The data is used to help make or change rules for fisherman. So, if the population of a species is declining, and the larger fish are the ones needed for reproduction, for example, a rule might be installed saying that fish of a certain size cannot be kept. I found this in Canada when I went fishing this summer for Walleyed Pike. We could only keep four fish a day, and only one of those could be over 18 inches long. This helped preserve the ones who will keep reproducing so the species won’t disappear. Conversely, if there are a huge amount of a species of fish, the rules could change to allow more larger fish to be kept. John loves his job because he loves seeing the diversity of fish. He spends 50% of his time on the boat to catch fish and the other 50% identifying fish in the lab. People are sent to him when they need a “fish expert”. John said if he had to name the one tool he couldn’t live without it would be his fish database by Oracle. It is computer software to catalogue fish species. There is even a way to easily create web pages, which he really likes. Now, related to this is a tool which already exists that he would love, but is very expensive. When we get certain little fish in the net, they are damaged (smushed) badly. He would like unlimited genetic testing of fish to verify the species. It would speed up identification of the fish. John’s strength in getting the word out about fish is through his passion and willingness to teach others. Cruises such as the one I am on are the perfect opportunity to teach others. I predict a book or magazine article about fish or fish identification to be in his future so he can share his love of fish even more. John’s advice to young people is to get stronger in math and science when it comes to school. When not at school, get outside and observe the world around you. So there is a tree on your hike. Do you know what kind it is? How tall will it grow? What lives on or in it? Look in the water. What type of fish are there? How is the type of water (pond, stream, lake) related to the fish that live there? Learn about your environment. Catch frogs and turtles and find out about them. John says all types of learning are important. He graduated from Roger Williams University in Rhode Island. Interestingly, several people on this ship graduated from there. There are several types of doors on a ship. One is what you find in a home with a handle rather than a knob. Then, there are heavy doors with a wheel for certain bulkhead doors going outside. And, my favorite, the big handled doors between compartments inside. These all used to be wheels, and I found them very difficult to manage when on my last cruise. Here is a mariner’s trick the captain was teaching the ensign on watch this morning. Remember these numbers. 6 & 10, 5 & 12. Did you know if you want to estimate a time of arrival (ETA) on a boat, you can calculate it quickly in your head? At 6 knots (kts) it takes 10 minutes to travel 1 nautical mile (nm). At 10 kts it takes 6 minutes to travel 1 nm. And at 5 kts it takes 12 minutes to travel 1 nm and at 12 kts it takes 5 minutes to travel 1 nm. How long would it take to travel 1 nm if steaming (traveling) at 20 kts? One of John’s favorite words: Congeners–These are things which appear incredibly similar; for fish it means the same genus, but different species. When I was trying to learn the different fish while sorting, I found the Croaker and the Spot to be similar. Both have a spot on their side, but the Spot’s spot is above his pectoral (side) fin and the Croaker’s is on its pectoral fin. The Pigfish, Butterfish, and Scup as well as the different Anchovies are difficult to identify when just learning. However, although these fish appear similar, all are in different genera and some in different families. An example of congeners that we have seen this trip would be the Marbled Puffer, Sphoeroides dorsalis, the Northern Puffer, Sphoeroides maculatus, and the Bandtail Puffer, Sphoeroides spengleri. All have the same genus, Sphoeroides – which implies that they are all very similar looking fishes. In fact, their body shapes are almost identical, but they each have different color patterns. If you spend all your time sitting at a computer, will you have more or less opportunity to understand about our environment? Can you see, hear, smell, feel, and taste it? Follow John’s advice and get outside more than you have been. Exploring the world around you is a great way to Sharpen the Saw, as we say at Weatherly using The Leader in Me program. Write down your guesses in the comments for this post.